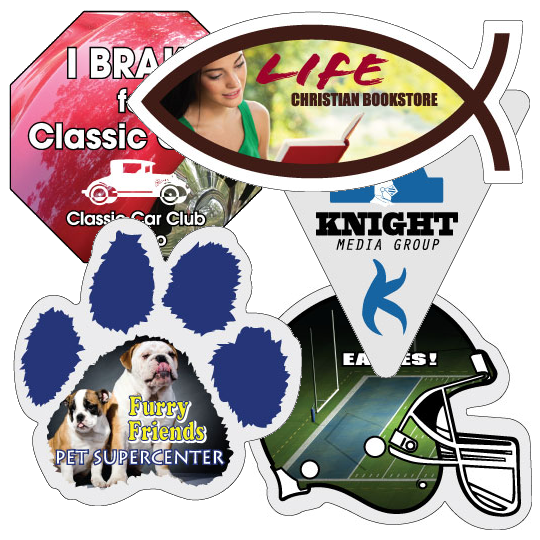 Our BEST VALUE Special Shapes Decals & Stickers are available in the following shapes both in spot color and digitally printed full color. Special shape stickers can be printed with back adhesive or front adhesive (for application on inside of window to be viewed on outside). Check out our Spring Sale for savings on Custom Printed Die-Cut Labels & Decals and Custom Stickers in the following link. 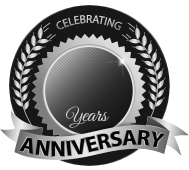 BBB Member since 2004 with a proven record of complaint free customer satisfaction on items like Custom Printed Die-Cut Labels & Decals. Click on the BBB logo above to check our record or leave a customer review. If you are in the market for Custom Stickers, give us a call today and you will soon realize why after 24 years we still have an A+ BBB rating! deSIGNery Sign Co. screen-prints badge shape, octagon shape and triangle shape decals in five sizes. Shield shape, stop sign shape and 3-sided shape dies for cutting are included in the best value cost. We screen-print special shaped decals on white pressure-sensitive vinyl or transparent clear polyester. Clear transparent polyester is available with either Back Adhesive or Face Adhesive. Our qualified design specialist will advise you on the type of material for your specific project. Please specify application needs when e-mailing or talking to our design consultant. We suggest that badge, octagon, yield sign, shield, 8-sided, triangle decals with face adhesive (decals mounted on one side of glass to be viewed from other side) have a white background printed behind the colors to make the color more opaque. The special shape stickers come with an easily removable protective liner for quick, flawless, professional application to any glass surface. White is considered an additional color on transparent decals. We can cover the complete backside of your transparent badge, octagon, triangle shaped decal or only cover the back colored areas with an outline for better visibility. Ask our design staff for suggestions on which way works best on your clear special shaped decals for visibility and readability. If text is thin or dark in color, a white outline may be required to increase visibility and readability. White is priced as an additional color. With the variety of shapes and sizes of our best value badge, octagon and triangle stickers, the uses are endless. Because we screen print on premium vinyl or clear transparent polyester stock, they can be used indoors as well as outdoors. These are a great value when you need special shape decals with vibrant colors, and is used in an area where there is not a lot of abrasion or solvents. I'm sure you will find numerous applications for our economically priced custom stickers. Remember, there is no need to spend over a hundred dollars to have a die made for that special badge shape decal, octagon shape decal, or triangle shape decal. We have eighteen (18) different sizes and shapes to satisfy most of your projects. Great eye-catching vibrant colored special shaped decals for company identification or corporate company logos. Our decals add a touch of class when used on your equipment or products to convey whatever warning, identification, or message you have in mind.